We all do it! We dream of attractions that do not exist and we dream big! What if they had a Mary Poppins ride or a Wreck It Ralph ride? Well this is exactly what we do in this weeks episode! 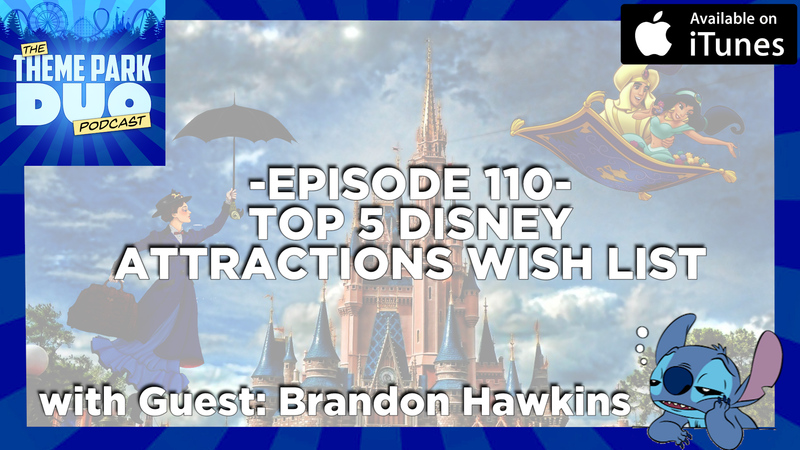 We are joined by Brandon Hawkins of TheHappiestBlogOnEarth.net to discuss what Disney Properties would create amazing themed attractions in the Disney Parks! We go to some main stream movies to some obscure 80’s Sunday Night Movies! It is an episode that is sure to make you cheer with joy because of nostalgic memories with these beloved movies! To celebrate Episode 10, we are debuting a brand new segment, PARK PEEVES! In this new segment we will talk about particular things people do at theme parks that annoy us to no extent! Also for the Theme Park Bulletin, we talk about the shocking news that Disney will be removing the Auction scene from Pirates of the Caribbean, the drama behind the Hall of Presidents and President Donald Trump, and the opening of the brand new DC themed attractions Justice League Battle for Metropolis over at Six Flags Magic Mountain! This is sure to be an episode NOT to be missed!